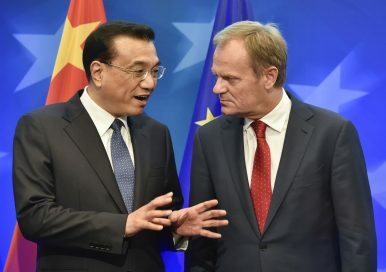 China's Premier Li Keqiang, left, speaks with European Council President Donald Tusk during an EU-China Summit at the European Council building in Brussels (June 29, 2015). Employing a data-centered, country-level approach, the ETNC does a remarkable job in inductively construing the systemic workings behind China’s foreign economic strategy, a strategy ultimately aimed at replacing the Western companies that currently dominate the high-end side of the global production chain. China, under the banner of “Made in China 2025,” is betting on virtually all high-tech industries; from robotics, sensors, and chips to aerospace and IT. Other strategic and competitive sectors include transportation and infrastructure, the utilities sector, and industrial machinery and equipment, with the top recipients of investment being the United Kingdom, Germany, Italy, and France. Echoing frustration from the lead nations about the slow legislative progress in Brussels, and the urgency of such a policy, French President Emmanuel Macron pressed member states to unite around the common framework earlier this month in Beijing. Broadly speaking, there are three reasons for the impasse. They are both interest-based and dogmatic, and relate to member states’ divergent views on the nature of Chinese investments and the role of government in addressing the challenge. First, the liberal norms of free trade, codified in EU and WTO treaty law and subject of the proposal, bar any review beyond security and public order. Nominally private or even state-owned entities, indirectly steered by the Chinese party-state, simply do not fit this framework. Even though the Commission’s proposal has a provision addressing foreign investors “controlled” or “funded” by a “government of a third country,” this only plays a role when the investment is in one of the critical industries listed. While the proposal addresses the high-end, technological side of Chinese investment, it does not encompass traditional manufacturing and consumer goods industries. Moreover, even if some (for example, electronic consumer industries) would be read into the wording of the text, the Commission could only give a nonbinding “opinion” on the tentative Chinese acquisition, which leaves the door open for Chinese investors to circumvent designated nations and seek an anchor point in a member state with a more laissez faire attitude to economics. Indeed it is this limited scope, which one senior EU policymaker called “an extremely light touch,” that explains the lack of enthusiasm from advanced industrial nations like Germany. Forging unity among nations with very different economies, then, hinges on agreeing first that Chinese investments in their current form are undesirable for the long-term competitiveness of the European market as a whole. The dogmatic considerations of some members are aptly demonstrated by the fact that currently only 12 of the EU countries have screening mechanisms in place. The geographical distribution of the countries without such mechanisms leads us to the second reason for the impasse: the deeper-running cleavage that runs through Europe in economic but also in political terms. In fact, the Eastern European countries that are part of the Chinese 16+1 initiative have the fiercest objection to any capping of much needed capital into their economies. The 16+1 initiative, aimed at dealing with the economically and institutionally weaker grouping of the Union separately, has adroitly exploited the changed political dynamics between countries like Hungary and Poland and the Western drivers of the Union, Germany and France. There is little doubt that the same calculations also swayed debt-ridden Greece, which, in the context of its fiscal feuds with the German-led austerity block, accepted a major Chinese stake in its economic infrastructure as part of China’s geoeconomic Belt and Road Initiative stretching across the Eurasian continent. The third, more abstract aspect concerns the question of framing. How do you sell limited protection of strategic and competitive industries domestically, while maintaining the (increasingly fragile) support for free trade regimes at home? There is also the question of separation between private and state affairs: how to deal with European executives and shareholders, who do not necessarily act in accordance with the public interest? This lack of public knowledge and awareness relates to the opaque nature of Chinese investments and the information “gap,” or asymmetry, between the Chinese companies and holdings that do the investments – united in tacit coordination by levers of the party-state and backed by Chinese state-owned financial institutions – and the ill-informed and privately owned European companies. Toward an Equitable and Reciprocal Relationship? While the Commission’s framework proposal is designed to increase transparency and oversight of inbound investment, a parallel effort is underway to conclude a Sino-EU investment treaty. In essence, the treaty is intended to create a more equitable, reciprocal investment climate for European businesses in China. While almost all Chinese investments in the EU yield brownfield acquisitions and majority ownership, the opposite is true with regard to European investment in China. European companies seeking to invest in China are forced into joint ventures with Chinese entities involving minority ownership and, hence, limited decision-making power and control. What is more, lured by the short-term gains the world’s largest consumer market offers, European industrial manufacturers and auto companies are often obligated to transfer their technology as a condition to operate and market their products in China. Playing off European countries against each other, these dealings are usually facilitated by bilateral agreements and located in special “economic zones” or “industrial parks.” An additional concern of all high-valued companies producing in China is the safeguarding of their intellectual property rights, as the number of supervising staff they can bring with them is limited. Meanwhile, negotiations on the bilateral treaty are marred by stalling tactics on the Chinese side and disunity and impotence on the European side. To add impetus to the negotiation, some have argued that the investment treaty and the screening proposal should be part of a joint deal, which would supposedly increase Europe’s leverage. Besides the fact that the Chinese leadership has not cared too much about reciprocity or Western complaints about unfair trade practices ever since then-U.S. President Bill Clinton brought the Chinese state-led market economy into the WTO, it misses the point. The Chinese party-state, by definition one might say, cannot and will not relinquish political control over domestic centers of power, the economy being chiefly among them. Indeed the common denominator in both the inbound and outbound investment conundrum is the role of the Chinese Communist Party (CCP) in the economy, the pervasive role and significance of which is still often underestimated. While certainly no longer communist in economic-ideological terms — besides a show of “socialist” rhetoric, that is — the CCP has never relinquished its authoritarian prerogative to manage the different realms of Chinese society. The key premise in understanding the workings of the hybrid Chinese politico-economic system is the notion that even though the central government often has no direct operational control, this doesn’t necessarily mean companies and investors do not “work for China.” The relationship between the central government and state-owned enterprises (SOEs) is characterized by the implicit “bargaining” relationship Lieberthal and Oksenberg established: to a great extent, these entities determine themselves how generally formulated national objectives are implemented. The financial and administrative oversight on how the SOEs operate, and whether this is done in accordance with the national objectives, lies with the State-owned Assets Supervision and Administration Commission (SASAC), which falls under the State Council of the prime minister. Additional enforcement instruments come from the party-run Central Organization Department (which handles appointments) and Central Commission for Discipline Inspection (in charge of corruption investigations). Yet even companies that are fully or partly private-owned cannot automatically be regarded as separate from the Chinese state. After all, they require a certain bureaucratic facilitation by the Party and the state to be able to grow their businesses; the investment capital typically comes from state-owned banks. This dependence on the party-state assumes an implicit reciprocal relationship. More overtly, the CCP has pushed for greater control inside private companies in recent years — not excluding foreign ones. Falling into President Xi Jinping’s broader ambition to strengthen “Party leadership” over society, around 70 percent of Chinese private enterprises now have mandatory CCP officials present. All in all, European companies and interests are thus often not dealing with strictly private investments. Last year at Davos, some Western news outlets seemed to have crowned Xi the new leader of free trade. No doubt, few countries have benefited more from globalization than China. Nonetheless, despite the perhaps wishful projection by certain foreign audiences, it is clear that substantially there has been a significant retrenchment under his leadership. Of the grand reforms stipulated in the Third Plenum of 2013, which promised that the market was going to play “a decisive role” in the economy, not much has materialized. Quite the opposite: while access to the Chinese market has been increasingly restricted, and competition within China by Western multinationals is hampered by unfair regulations and enforcement, Chinese companies, notably the still-dominant SOEs, are financially advantaged. This conclusion should, in turn, inform Europe’s response to China’s foreign economic strategy. The Commission’s legislative proposal is a good start but will probably not be sufficient to counteract Beijing’s decentralized, tacitly coordinated effort; Chinese entities will likely use the lacunas in the law and navigate toward those valuable industries not covered. Alternatively, they could utilize their capital appeal to find “points of entree” in eastern and southeastern EU member states. The Commission’s “opinions,” or “comments” by potentially affected other member states, will be inadequate in this regard. The proposal as it is, in other words, is unlikely to make a dent. If the EU truly wants to level the playing field, it would have to go much further than the Commission’s proposal, tackling the volume and nature of the investment imbalance, the industries open to external capital and majority ownership, and market access and freedom of operation. That is, if European and WTO treaty law would allow it, and the EU is willing to risk a backlash from Beijing. In any case, as the difficulties surrounding the current legislative effort have shown, any effort will prove futile if the underlying divides internally are not bridged in a more structural way first. The starting point should therefore be the building of some kind of consensus among the very different members of the Union as to what the challenge is that they are facing, and how their divergence when it comes to interests and, most significantly, economic philosophy, can be ameliorated.